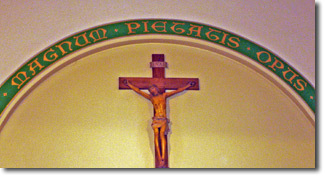 What Does 'Magnum Pietatis Opus' Mean? The answer to this question is quite a good one. The three words are taken from a much longer quote: ‘O magnum pietatis opus! Mors tua mortua tunc est, quando hoc in ligno mortua vita fuit’. This is the antiphon in The Divine Office for the feast of The Exaltation of the Cross (September 14th) Evening Prayer II. The English translation is: ‘This was Love’s great deed that death should die, when Life itself was slain upon the tree’. So our short inscription could be translated as: ‘Love’s Great Work’. Why Do We Have Latin Inscriptions? Why Do We Have Candles At Mass? What’s The Point Of Fasting?